The Teledyne DALSA Calibir series features a compact, versatile and modular thermal imaging platform with either 640 x 480 (VGA) or 320 x 240 (QVGA) resolution. Running at 30 frames/s, these 17 µm pixel pitch uncooled micobolometer cameras capture thermal IR images in the long wave infrared band (8 μm to 14 μm). Teledyne DALSA offers a unique capability for manufacturing its own QVGA uncooled long-wavelength infrared detectors. These detectors use Vanadium Oxide microbolometer technology and are produced in Teledyne DALSA's own foundry in Canada. The camera features shutterless technology and does not require non-uniformity correction (NUC) calibration at power-up. The shutterless mode of operation not only eliminates dark images (a side effect of in-field NUC recalibration) but also enables rapid image output after power up. The Calibir standard feature set includes thermally stable NUC, broad selection of athermal lenses and industry standard GigE Vision, analogue and MIPI CSI-2SM interfaces. In addition, the Calibir Series features support for PTP (IEEE 1588) for multi-camera synchronisation, built-in mechanical shutter to protect the detector and radiometric capabilities to measure the absolute temperature. All this, combined with modular design and unprecedented ease of use makes the Calibir series ideal for thermal imaging solutions in the field of machine vision, UAV, surveillance, defence and security. 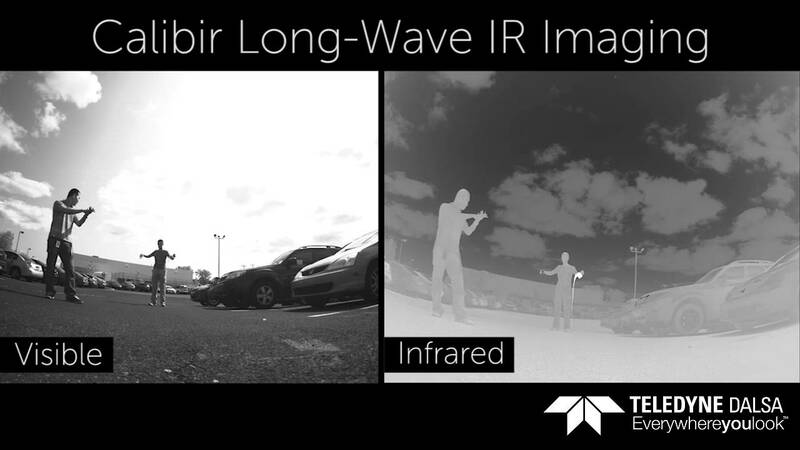 Teledyne DALSA shows a direct comparison between a scene recorded with a visible light camera and with the longwave infrared camera Calibir. The Teledyne DALSA Calibir cameras are factory calibrated and thus require no in-field recalibration, especially at power up. This enables instant image output and no interruption for recalibration. The image output of the Calibir camera remains stable across time and temperature range. Thanks to the adaptive contrast enhancement, Teledyne DALSA Calibir’s advanced image processing algorithms adapt to the image content, optimising contrast to show the finest details and deliver high quality images. With no manual intervention for image adaption required, the Calibir series delivers high contrast images - even in changing environmental conditions. This significantly improves data evaluation. The extremely small, lightweight and modular housing allows the design of very compact OEM and multi camera solutions. The integration into existing systems with restricted space availability for machine vision components is simplified. Multiple independent sensor zones allow several temperature measurement and monitoring tasks to be conducted with a single device. Independent emissivity of those areas are used for the actual temperature calculations. With precise temperature monitoring adapted to the object surface, the production process can be observed more reliably, which is a precondition for 100% quality control . The Calibir features a number of advanced preprocessing algorithms that adapt to the image content. As an example, the Adaptive Contrast Enhancement optimises contrast to show the finest details regardless of conditions or intra-scene variations. Built-in pseudo-colour provides enhanced visualisation. DALSA CALIBIR AB 16.8MM 0.31 30 M25 640 480 1"
DALSA CALIBIR GE 14.2MM 0.31 30 M25 640 480 1"
DALSA CALIBIR GE 16.8MM 0.31 30 M25 640 480 1"
DALSA CALIBIR GE 25MM 0.31 30 M25 640 480 1"
DALSA CALIBIR GE 50MM 0.31 30 M34 640 480 1"
DALSA CALIBIR GE 8.5MM 0.31 30 M25 640 480 1"